Flying the best airliner in the world! A380 Captain for British Airways. Member of #BASMART team. End of the line for the A380? I’ve had lots of questions online and also recently from Kay Burley while we were waiting for the BOAC liveried 747-400 to arrive at Heathrow about the decision by Airbus to stop making the A380. So I thought I’d put down a few thoughts and points about my experience of flying the A380 and the decision which has been taken. The A380 is, without doubt, the best airliner I have flown. From a pilot’s perspective it is without equal. It has the best and quietest flight deck, superb systems, an amazing level of redundancy in those systems, and is a beautiful aircraft to fly both through the automatics and manually via the side stick. I also believe it offers the best passenger experience of any aircraft flying today. It is quieter, smoother, more spacious, extremely popular with passengers, and rides turbulence better than anything else in the skies. So you would think all would be rosy for the aircraft’s future. However, the A380 has a couple of problems. From a technical point of view there is the problem of physically fitting it in to airports. By this I don’t mean it’s weight, which per wheel is no higher than other large jets, but the wingspan does cause issues. Most airports around the world have been made with the 65m wingspan of the Boeing 747 in mind. The A380 has an 80m wingspan. This amazing and beautiful wing gives the A380 phenomenal performance in terms of lifting power, the ability to climb to high altitude far earlier in the flight than other large aircraft, and lower approach speeds than most jets regardless of size, which is why it almost appears to float towards the runway for landing. However, it does pose a problem when manoeuvring the A380 on the ground. Most airports only have a limited number of taxiways which are wide enough to take the A380. There are other technical issues such as the requirement for powerful push-back vehicles, provision of jetties which can access the upper and lower decks, and gate areas which can cope with the number of people waiting to board the 469 seater jet, amongst other practical and logistical issues which have to be considered when operating such a large aircraft. The second, and more major problem in terms of airline ownership, is the cost of running this enormous aircraft. The A380 is a very economical aircraft to run with one proviso, it has to be full and/or be carrying high yield passengers to make money. An A380 will use approximately 125000 kg of fuel on a typical London to Los Angeles flight. This is a large number! However, if the aircraft is full it can make a good return for the airline and the passengers will have had a very comfortable, pleasant and relaxing flight. While we are operating in an economic climate which allows airlines to fill their A380s with passengers paying reasonable prices for their tickets everyone, airline executives and passengers alike, will be happy. The problem for airlines is what happens when the inevitable economic downturn happens? These downturns always come along eventually during the 25 year lifespan of an airliner. This, in my opinion, is the A380’s Achilles’ heel and the reason most airlines have been reluctant to order the aircraft in large numbers. If you can’t fill an A380 flying it becomes an expensive, and quite possibly loss making exercise. The same is true for most aircraft, but due to its size the numbers involved with the A380 are proportionately higher than smaller airliners. It also doesn’t have the flexibility of quick route structure changes which other, smaller aircraft have. It is a relatively simple task to switch from a Boeing 777 on a route to a smaller 787 if required. Airlines can’t just decide to start using their A380s on different routes due to the planning and potential infrastructure changes required at destination airports. There is significantly more planning required by all concerned once an airline decides to send an A380 to a new airport. Additionally, the very latest large twin-engined aircraft being produced by Airbus and Boeing have taken some of the designs and techniques used in the manufacture of the A380, such as the use of lightweight and very strong composite materials, to the next level. Consequently, the A380 finds itself competing with it’s own parent company’s A350-1000 in the eyes of many airline executives. And in the majority of cases, unless there is a specific requirement to have the extra carrying capacity of the A380, the A350-1000 and/or new Boeing 777X are likely to win the order on economic and flexibility reasons. These and other factors have lead to the decision by Airbus to stop manufacturing this incredible aircraft in 2021. On a personal level this is upsetting, as I know how wonderful the aircraft is to fly and how much the passengers I speak to every day find the aircraft fascinating, remarkable and comfortable in equal measure. I also hope British Airways can find a way to buy some more aircraft before the end of the production run, or maybe even tap into the second hand market as some airlines decide to remove the A380 from their fleets. But that is a personal wish and unfortunately I am not in the position to make those decisions. Indeed, even if I were, it may well be that the economics just wouldn’t work. The good news is the A380 isn’t going to disappear any time soon. People will still be flying in these lovely aircraft for another 20 years or more. The A350 is a superb aircraft which incorporates many systems originally developed for the A380. I have no doubt Boeing’s new 777X will also be a fantastic aeroplane. But neither of them are the kinds of aircraft people stop what they are doing to watch. The 747 was probably the first airliner which people just looked at and held their breath when they saw the size of it and watched in wonderment as it somehow launched itself into the air. Concorde was similar with it’s unparalleled mix of beauty and raw power. The A380 was the next aircraft in this series. I will admit it doesn’t have the iconic shape of the “Queen Of The Skies” 747 or the sleek and distinctive lines of Concorde, but people do still stop and stare. They do still marvel at how over 560 tonnes of aircraft can appear to take off so effortlessly. And they are still amazed at the comfort level and peacefulness in the cabin. The A380 is going to be around for many years yet, and I am in the extremely fortunate position of being a Captain on the best airliner in the skies. If you haven’t experienced a flight on an A380 then try to make sure your next longhaul flight is on one. You won’t regret it. How to land the largest passenger aircraft in the world! Well it has been a while since I’ve put a blog post together. Sorry about that. I have been very busy with various projects including the videos which I hope you have seen and enjoyed. I have previously discussed how we get the A380 into the air, now comes the tricky bit….landing it. A typical landing weight for the A380 is a quite remarkable 365-370 tonnes! To put that into context, that is only 30 or so tonnes below the maximum takeoff weight of a 747-400! However, due to the quite brilliant wing design, the final approach and landing speed of the A380 is actually quite low. Lower, in fact, than the 747, 767, 777, and 787. In a recently published notice by Air Traffic Control at Heathrow, they state their typical approach speed of an A380 to be 133 knots. By comparison the 777-300 approach speed is stated as 143 knots and the 747-400 as 144 knots. This only adds to the appearance of the A380 flying so slowly near the ground. We will start our approach around 20 miles from the runway. At this point we would normally be flying at 220 knots. The wing is designed for optimum performance at high speed. If we want to fly slower than around 200 knots we have to change the shape to make it more curved and add extra lift using slats on the leading edge and flaps on the trailing edge. These are the large surfaces you will see moving as we slow down to final approach speeds. There are 8 slat surfaces and 3 flap surfaces on each wing. In addition, the three ailerons also act as flaps in what is termed a droop function. At this point we would typically reduce our speed to 180 knots. In order to do this we check the airspeed is below the maximum speed for Flap 1, then move the flap lever on the centre console to the Flap 1 position. Unlike Boeing aircraft, which have flap settings which correspond to the angle of flap deployment, Airbus have gone with a simpler nomenclature of Flap 1, 2, 3, and Full. There is also a Flap 1+F position, but this cannot be directly selected. When we first reduce speed and select Flap 1, only the leading edge slats extend. When the speed drops below 205 knots the first stage of flaps automatically extends, resulting in the 1+F (flap) setting. This setting actually gives 20° of slats, 8° of flaps, and 5° of aileron droop. The table below gives the surface positions for each flap lever position. The speed of 180 knots is a typical speed at which we start down the glideslope to the runway. At busier airports, Air Traffic Control have to ensure aircraft do not get too close together on the approach, but also need to maintain a high flow rate for landing, so accurate speed control is essential. The next speed reduction will be to 160 knots. This requires further flap extension to configuration 2. We will typically hold this speed until 5 miles from the runway, at which time we will select the landing gear down, Flap 3, and start reducing to our final approach speed. The majority of landings are conducted at Flap FULL position, in order to minimise the approach speed. However, there are certain situations where we may wish to land using Flap 3 instead. This results in a slightly higher approach speed, but may be preferable if we are landing, for example, on a day where significant windshear has been reported on final approach and there is an increased possibility of having to perform a go-around. Flap 3 produces significantly less aerodynamic drag than Flap FULL, so the aircraft performance in a go-around would be better. By 1000 feet above the airfield we will be established on the final approach with the undercarriage locked down, the flaps at landing position, at our final approach speed of around 135 knots. This is a mandatory requirement for safety reasons. We have to be fully set up for landing by 1000 feet above the runway. Now the fun part…Putting 370 tonnes of aircraft onto the runway in exactly the right place. Each runway has a touchdown zone. We MUST land within this touchdown zone. If it becomes obvious we are not going to land by the end of the touchdown zone we have to fly a go-around. This is because our landing performance is calculated based on us landing within the touchdown zone. If we were to land beyond the end of it there is a chance we would not have enough runway left to stop the aircraft. Unfortunately, over the years, there have been a number of accidents which have been caused by pilots not flying a go-around when they have ‘floated’ too far down the runway. Therefore, the British Airways Safe Landing Policy is explicit in allowing either pilot to call go-around if they consider the aircraft will not land in the right place. As always, safety is our number one concern. But let’s get on with the practicalities of actually landing the aircraft. We will assume this is to be a manual landing, not an automatic one. The vast majority of landings are flown manually. Automatic landings are normally only carried out in foggy conditions. The landing pilot will have taken control of the aircraft just below 1000 feet. They will concentrating on keeping the aircraft flying down the extended centreline of the runway. This is done by imagining the painted line running down the centre of the runway extending beyond the runway itself and coming straight at you. The idea is you keep that pointing straight at you by moving the aircraft left or right as appropriate. It is also essential to keep descending at the correct rate and following the 3 degree glideslope to the runway. This is done partly by reference to the flight instruments, but also by looking outside at the runway. All pilots have a mental image in their mind of how a runway should look, the perspective, and the angle. Over time it becomes automatic to manoeuvre the aircraft on the approach to maintain this visual image. The closer you get to the runway, the more time is spent looking out at it, with just the odd flick of the eyes back inside to look at the instruments to make sure all is ok. This is the view from the flight deck at 500 feet above the landing runway…. Continuing down the approach to 200 feet above the runway…. The PAPIs (Precision Approach Path Indicator) lights are visible to the left of the runway. We should touch down next to these. If we are on the correct glideslope we will see two red lights and two white lights. More reds than white mean we are too low, and more white than red mean we are too high. Now just 100 feet above the runway. PAPIs very clear. On the glideslope. Centreline of the runway pointing straight at us. At 100 feet above the runway the flight control laws change. Pitch trim is no longer automatic, and the previous pitch flight control law changes to a landing ‘flare’ law. This is a modified pitch law which provides smoother control, allowing precise control of vertical speed and touchdown point. Now only 50 feet above the runway…. At around 20 feet close the thrust levers. The aircraft has an automatic call out of ‘RETARD’ as a reminder. It may be necessary to close the thrust levers earlier or later than this depending on the weather conditions. Keep looking down the end of the runway. Do not allow the aircraft to roll and if necessary use rudder to bring the nose of the aircraft left or right to point directly down the runway just before touchdown. This is called the ‘crabbing’ technique when there is a crosswind. Wait for touchdown, making very minor corrections if required. DO NOT over-control. At touchdown the ground spoilers extend to ‘dump’ the majority of the lift, putting weight onto the wheels as the automatic brakes activate. Select reverse thrust as required, always a minimum of idle. The A380 only has reverse thrust on the inner engines. Use the rudder pedals to keep the aircraft tracking the centreline of the runway. Lower the nose gently without delaying touchdown. It must be flown onto the runway and there may be a slight pitch up tendency as the ground spoilers deploy. Congratulations! You have just landed 370 tonnes of A380 in Vancouver! I hope this has been an interesting introduction in how to land an A380. If you have any comments or questions please ask…..
Below is the video of our landing at Vancouver on runway 08L on 11th September 2017, from which the above still photos were extracted. I hope now you have read the above description you can see exactly what First Officer Jon Leggett was doing as he performed this perfect landing. British Airways operate the Airbus A318 from London City Airport to New York JFK. Due to the unique nature of the steep approach required into London City Airport, at a 5.5 degree angle rather than the usual 3 degrees at most airports, the A318 has been modified with a ‘Steep Approach’ function. It is the largest aircraft with can operate at London City Airport. The runway there is also far shorter than most used by commercial jets, and only 30m wide compared to either 45m or 60m at most major airports. The length of the runway means the takeoff is frequently performed at full power or just below it, resulting in a very ‘sporty’ takeoff! The approach is flown at almost twice the rate of descent until around 62 feet above the runway, when the ‘flare’ to landing commences. In 2012 I was fortunate enough to fly the A318 to Farnborough Airshow. We filmed the takeoff and a couple of landings at London City Airport and showed the resulting videos on a large screen positioned next to the aircraft on display. The quality of the video is not up to modern day 4K standards! But I hope you enjoy seeing the view from the flight deck during operations at this unique airport. We also produced a photo slideshow to tell the story of a round trip from London to New York and back again. Set to a wonderful piece of music by Mark Knopfler. Slideshow. Most photos taken by myself. Thank you to those others who’s photos I have included here. Hope you like the music. One of my favourite pieces by Marvin Hamlisch. This is the one part of the A380 course which I worked my way through, closed my eyes, took a deep breath, then went back to the start of the topic and started again! In the words of Amy Pond….. The ultimate aim of any fuel system is to deliver the right amount of fuel at the right pressure to the engines at all times. But as an ultra-longhaul aircraft of such size, the percentage of the total weight of the aircraft at maximum weight which is fuel can be very high. For our British Airways aircraft the maximum takeoff weight is 569000kg. Of this, up to 254000kg could be fuel. Around 44.5% of the total weight. As the flight progresses this will obviously decrease. But storing the fuel the wings, as shown by this diagram, brings with it some challenges and complications. The design of the A380 wing is what is known as a ‘swept wing’. This means it doesn’t go out from the side of the fuselage at 90°, but instead is swept back at an angle of 33.5°. Therefore, as the fuel is used during flight, the centre of gravity, ie. the balance point of the aircraft, moves quite significantly. All aircraft designs have an optimum point for the centre of gravity (C of G). In order to keep the A380 C of G at the optimum for as long as possible the aircraft has a large fuel tank in the horizontal stabiliser at the rear. During flight fuel is transferred out of this into the other tanks, so maintaining the optimal balance point. Moving fuel around the aircraft between the various tanks is what makes the A380 fuel system so complex. There are 11 main tanks used to store fuel. Each wing has 5 main tanks. An outer tank, a mid tank, an inner tank and two feed tanks. The final storage tank is the one in the horizontal stabiliser at the rear, known as the trim tank. In addition to these tanks there are various surge tanks and vent tanks. Surge tanks are there to collect any overflow from the main tanks which may occur when they are full. This can happen if the fuel expands or if it ‘sloshes’ out of the tanks during tight turns during taxi. The vent tanks connect the main tanks to the outside atmosphere. Using a vent tank limits the differential pressure between the main tanks and the atmosphere, keeping it within structural limits. Fuel is supplied to the engines via the feed tanks. The outer, mid, inner and trim tanks can be considered as storage tanks which are used to keep the feed tanks full. Each engine has it’s own feed tank. Feed tanks 1 and 4 have a capacity of 27632 litres (21691kg) with feed tanks 2 and 3 being slightly larger at 29349 litres (23039kg). If there is a problem with a feed tank an engine can be supplied with fuel from other feed tanks using a crossfeed system. Before describing any more of the fuel system it may be useful to explain the difference between the litres and kg figures given above. Aviation fuel has a typical specific gravity of around 0.785 kg/l. This means that each litre of fuel weighs 0.785kg. For anyone not used to dealing with specific gravities this can be a slightly strange concept. We are all used to dealing with water, which has a specific gravity of approximately 1kg/l. (It does vary with temperature, but let’s ignore that for now!). Simply put, if we pour 1 litre of water into a jug which is placed on a set of scales, we will find it weighs 1kg. Aviation fuel is less dense than water, so if we were to do the same again we would find out 1 litre of aviation fuel would only weigh 0.785kg. For us it is the weight of fuel which is important rather than the volume. Our aircraft systems are calibrated in kgs (or pounds in some cases) rather than litres. Consequently you will hear pilots talk about how many kg or tonnes of fuel they have ordered for the flight, rather than how many litres. This diagram shows one of the fuel system pages we can display in the flight deck. Let’s work our way down from top to bottom to explain what we are seeing here. FU TOTAL is the total fuel used on our flight so far, 11000kg. The four sets of 2750 show how much fuel each engine has used. Each engine has a line with an arrow pointing toward the top. This shows fuel flowing into the engine. The circles just below the arrows depict fuel valves. In this case you can see the green line is going through the circle, showing the valve is open and fuel is flowing. Slightly below and to the side of each of these open valves you will see a corresponding valve which is still coloured green, but is depicted as being closed. This means the valve is in the correct position which has been selected by the fuel system, but at the moment there is no fuel flowing through it. This is the general way Airbus have set up their information systems for us. If a valve or other component is coloured green it means it is in the correct setting as instructed. If it is amber it means something is wrong or it is in the process of moving. Below these valves we come to a series of small boxes. Some of these are coloured green and some white. These are the engine fuel pumps. Here, a green pump shows it is working properly and pumping fuel. A white pump means it is turned off. The main body of this display is a representation of the wing. Below each of the engine pumps is a box representing a feed tank. The numbers indicate the remaining fuel in kg. You will see that each feed tank is actually split into two chambers. The smaller one, in this case containing 1000kg of fuel, is called a collector cell. The engine fuel pumps are actually contained in the collector cell, where the fuel is used as a cooling agent. In the lower half of the feed tanks you will see a number, -10. This is a fuel temperature gauge. In most areas of the world we use either Jet A1 or Jet A fuel. Jet A1 is the standard in the UK and has a freeze point of -47°C. Jet A is more common in the USA and has a freeze point of around -40°C. With outside air temperatures typically -55°C, but sometimes as low as -70°C and below, it is important that we monitor the temperature of the fuel to make sure it is still a liquid! If it is getting too cold, we would either have to fly faster (increased friction increases the temperature of the air over the wings) or descend into warmer air. The numerous white pointed arrows you can see in the diagram depict valves which are not in use at the moment, but show how we can move fuel from one tank to another. The next row of tanks down in this diagram show the inner, mid and outer tank in each wing, and their respective fuel quantities. Finally, we have a line to another tank at the bottom of the display. This shows the trim tank contained at the rear of the aircraft. Finally we have an indication of the total fuel flow to the engines at present, shown as ALL ENGines Fuel Flow. So that is the basic design and layout of the A380 fuel system. The next thing the designers had to consider is how to move all this fuel around while maintaining the optimum centre of gravity for the aircraft during flight. To to this, they use a network of pipes and valves known as galleries. There are two of these, termed the forward and aft galleries. Complicated, but bear with me! I earlier described the inner, mid and outer tanks as storage tanks. Now we know there is a transfer system it is easier to consider these as transfer tanks. Each transfer tank has a pump connected to the forward gallery. Each feed and transfer tank can receive fuel from the forward gallery via an inlet valve. The inner and mid tanks have a pump connected to the aft gallery, and again, each feed and transfer tank can receive fuel from the aft gallery via an inlet valve. The trim tank is connected to both the forward and aft galleries. The forward gallery is used to transfer fuel between all the wing tanks. The aft gallery is used to transfer fuel from the trim tank to the wing tanks. The trim tank can accept fuel during refuel operations before the flight and while on the ground in order to change the centre of gravity. However, in flight, fuel can only from from the trim tank to the wing tanks, not the other way. The design of the gallery system means if there is a failure in one of the galleries, the other can take over and complete the fuel transfer. Refuelling is carried out using the galleries. There are two refuelling points installed under the wings, each of which can accept two fuel hoses from the refuelling vehicle. When both hoses are in use it takes around 45 minutes to upload 200 tonnes of fuel. This photograph show how enormous the A380 wings and engine are as they dwarf the refuelling truck! Rather than refuel via tankers, most major airports have an underground network of fuel pipes supplying fuel to each parking stand. The refuelling truck connects to this underground network and uses a pump used to load the fuel into the aircraft. On the flight deck there is a dedicated fuel control panel above the pilots. One of our setup actions is to turn on 20 fuel pumps! In flight the transfer of fuel between tanks is completely automatic (so long as the system is working properly!). Shortly after takeoff what is known as a Load Alleviation Transfer takes place. Here, fuel is transferred from the inner or mid tanks to the outer tanks in order to reduce the upward bending of the wing. Anyone who has watched an A380 take off from a window seat may have noticed the wing tips lifting by up to 4 metres during takeoff due to the airflow. Transferring fuel to the outer tanks reduces this. You may ask why these tanks are not, therefore, filled before takeoff. That is because the weight of the engines makes the wings bend down and any extra fuel in the outer tanks would only increase this. Filling the outer tanks also has the effect of moving the C of G rearward to around 41% This is the approximate targeted C of G for the cruise. The fuel transfer rate from inner or mid tanks to the feed tanks is around 10000 kg per hour per feed tank. Once trim tank transfers start they are performed in a way which maintains the optimum C of G for as long as possible, until eventually the trim tank is empty. From this point on the C of G will continue to move forward as fuel is used and transferred from the outer tanks. I mentioned the freeze point of aviation fuel earlier. Usually in the range -40 to -47°C. The temperature of the fuel in the outer tanks tends to decrease more rapidly than in the other tanks during flight. In order to avoid this fuel freezing the system automatically transfers it from the outer to the feed tanks if the fuel temperature drops below -35°C. If this results in the feed tanks being filled any extra fuel is transferred to the inner tanks. Towards the end of the flight there are two additional fuel transfers. Any fuel remaining in the trim tank when the time remaining to destination drops below 80 minutes is pumped forward. Similarly, when the time remaining to destination drops below 30 minutes any fuel left in the outer tanks is moved. By now you have probably come to the conclusion that the A380 fuel system is reasonably complex. I’d agree! Now consider that everything I have described above is what happens when it is all working correctly! With so many pumps, valves and sensors we also have to consider how we handle things when part of the system stops working. 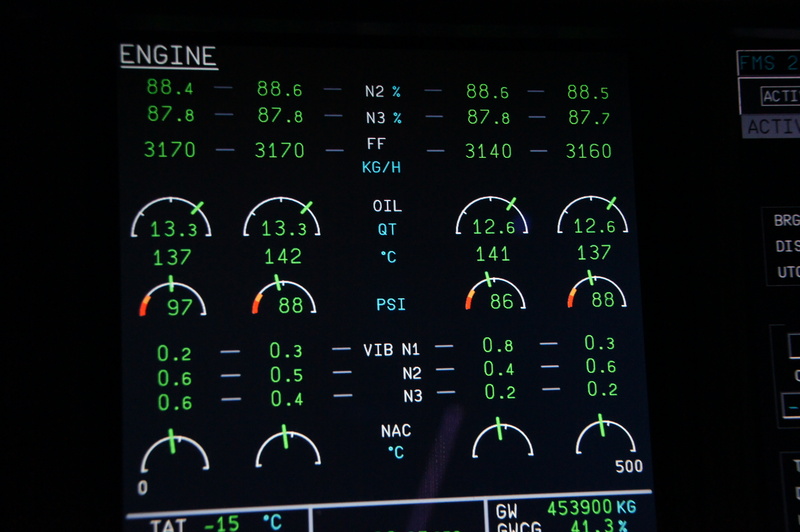 It is these considerations which make the A380 fuel system quite so challenging for us as pilots. I don’t intend to go into detail here about what we would do in each failure case. That would change this from a blog to a book! You only have to imagine how much extra work it would be if all the automatic transfers I mentioned above didn’t work as designed. Indeed, the system on the A380 is somewhat similar to that used on Concorde. However, on the supersonic airliner a Flight Engineer had to do all the fuel transferring by manual switch and pump selection. In the event of certain fuel system problems we have to do the same on the A380, as the centre of gravity of an aircraft is critical in flight. I hope the above has given you some insight into the extremely important role fuel plays in the way we operate the A380. For most aircraft fuel is just loaded into the tanks to the required level, used in flight, and that is it. The nature and sheer size of the A380 means we have a much more complex fuel system. But by imaginative use of the fuel in order to maintain the optimum centre of gravity for as long as possible in flight, the designers have found a way to not only power the aircraft but also make use of it to improve efficiency. I’ll just keep my fingers crossed that the automatic fuel control systems keep working, otherwise the flight will get just a little busier for us up in the flight deck! Thanks for reading. Hope you found it interesting. Well done if you made it this far! One final and interesting point is the fuel capacity of the A380 trim tank is almost identical to the total fuel capacity of an Airbus A320! I think we will move to something a little less complicated for my next blog….How to land an A380! The A380 wing. A complex work of art! The A380 wing is a remarkable piece of engineering. Made in Broughton, North Wales, it is one of the defining features of the A380. The largest wing used on a commercial aircraft before the A380 was designed belonged to the Boeing 747-400. It has a wingspan of 64.9 metres. Consequently, most major airports have been designed with this wingspan in mind. The A380 wing changed the rules! With a maximum takeoff weight of 575 tonnes, some 178 tonnes greater than the 747-400, a much larger wing was required. This photograph clearly shows the much larger wing of the A380 compared to the 747. The A380 has a wingspan of 79.676m and an area of 845.8m². Compare that to the wing of the 747-400 which has an area of 541.2m². And we should remember that the 747-400 is a very large aircraft. Trivia fans will note this means there is space to park 144 cars on each side of the the A380 wing! Each A380 wing has 3 ailerons, 8 spoilers, 8 slats and 3 flaps. These are terms you may well have heard before. But if not, what does each one mean? Ailerons – These are used mainly at low speed (below 240 knots) to make the aircraft bank (or roll) from side to side. They move in opposite directions on each wing. Therefore, if we want the aircraft to bank left, the ailerons on the left wing will move up and those on the right will move down. This has the effect of dropping the left wing and raising the right wing. The ailerons on the A380 are also used as part of an active system to reduce the effect of turbulence. More of that later… Each aileron has a maximum deflection of 20° down and 30° up. Spoilers – These are only on the upper surface of the wing. They have several uses. Firstly, the outer 6 spoilers are used for roll control at higher speeds. In this case, only the spoilers on one wing will move, with a maximum deflection of 45°. Secondly, all 8 spoilers on each wing can be used as speed brakes. You may have seen the spoilers on an aircraft rise during descent. They effectively reduce the lift from the wing and act as air brakes, useful if we want to slow down or go down more rapidly. This will be accompanied by a slight rumbling feeling inside the aircraft. Nothing to worry about. But if ever you have felt it, now you know why! Their final function is to ‘dump’ the lift from the wing on landing to prevent the aircraft going back into the air. Cleverly, this ground spoiler function has two phases. When one main landing gear is sensed as having touched down the ground spoilers partially extend (spoilers 1 and 2 by 10° and 3 to 8 by 15°. This slightly reduces the lift produced by the wing and aids in a gentle touchdown. Once three main landing gears are sensed on the ground the spoilers extend fully (1 and 2 to 35°, 3 to 8 up to 50°). The ailerons also deflect upwards to 25° acting as additional spoilers and air brakes. This movement of the spoilers and ailerons will also occur if a rejected takeoff is performed from a speed greater than 72 knots. Slats and Flaps – Slats and flaps provide lift augmentation. Simply put, aircraft wings are designed to work best at their cruising speed. But we wouldn’t want to try and land the aircraft at that speed! The normal wing shape has a range of operating speeds, but even on superb design such as the A380, this will not be below around 190 knots at landing weight, and more like 230 knots at takeoff weight. In order to allow the aircraft to fly at lower speeds during takeoff and landing the shape of the wing has to be changed. In order to do this there are various stages of slats (front or leading edge of the wing) and flaps (rear or trailing edge) which can be extended. For those interested in the technical working of these systems, the A380 slats are moved by an electric motor and a hydraulic motor whereas the flaps are driven purely by hydraulic motors. If you have flown on an A380 you will quite probably have heard a quite high pitched ‘whining’ noise when the slats move. It is these motors which generate that noise. Airbus aircraft use a standard set of slat/flap configurations which depend on flight phase and speed. Convention is that we always ask for a flap setting rather than a slat and flap setting. This is true on Boeing and Airbus aircraft. We ask for the required flap setting knowing that the slats will also move to a corresponding setting. The slats and flaps are controlled using a lever on the centre console between the pilots. For takeoff, the A380 has three possible slat/flap positions (known as configurations). These are 1, 2 and 3. We action a takeoff performance calculation using one of the apps installed on the aircraft in order to determine the best flap setting for each individual takeoff. There are several factors to consider here. Flap 1 gives the highest takeoff speeds and greatest after takeoff climb gradient, but due to the higher speed needed before takeoff uses more runway. Flap 3 gives the lowest speeds for takeoff but also a reduced initial climb gradient because in addition to producing more lift at lower speeds, flap 3 also produces more drag. For landing we can use Flap Full or Flap 3. In most cases flap 3 is used. The angle of slat and flap extended for each configuration is shown in the table below. What is aileron droop? In certain configurations the A380 extends the ailerons down on both wings by 5° in order to provide additional low speed lift, effectively turning them into small flaps. You will see from the table that each configuration has a maximum speed. We need to be mindful of this when making flap selections. In addition to the AES we also have the wonderfully named ARS system! (Always raises a smile when we discuss it during takeoff briefings!) ARS = Automatic Retraction System. For higher weight takeoffs the speed at which we would normally retract the flaps setting from 1+F to zero can be close to the limiting speed of 222 knots. In this case, in order to protect the flaps from overspeed, the ARS automatically retracts them to zero leaving only the slats extended when the aircraft accelerates past 212 knots. Very clever! The wings have one further vital function. They act as massive fuel tanks. Each wing contains five fuel main fuel tanks, a surge tank, and a vent tank. The surge tanks temporarily collect fuel which may overflow from any tank when they are close to being full. For example, fuel may overflow a full tank during a tight turn while taxiing. The vent tanks connect the fuel tanks to exterior atmospheric pressure in order to limit the differential pressure between the tanks and the atmosphere. The fuel tanks are huge! Each wing has a capacity of 149924 litres! That’s around 120 tonnes. The trim tank at the rear can hold 23698 litres, which is almost the same as the total fuel capacity of an A320! If you want to ‘fill-her-up’ you will need to put 323546 litres in the tanks. One complication of making these amazing wings in North Wales is they have to be transported to the Airbus factory in Toulouse where the aircraft is assembled. This is a major logistical operation! A Multi-Purpose Vehicle is used to transport the wings on the 1.6km journey from the Broughton factory to the River Dee. This MPV is 22 metres long, has 96 wheels, and with the wing plus the carrying jig, carries around 140 tonnes. The MPV drives on board the Dee River Craft to place the wing in position for its 24km journey along the river to the Port of Mostyn. From here, another MPV collects the wings where they are put on the roll-on-roll-off ship Cuidad de Cadiz where they sail to Pauillac, the nearest port to Toulouse. On arrival in Pauillac they are transferred on to barges which transport them 95km up the Garonne river to Langon. From there the final 240km of the journey is by road. The Langon to Toulouse journey passes through 21 towns and villages. Much of this journey is done at night to avoid disruption. I was lucky enough to be invited to the Airbus factory in Toulouse in April 2017. This included a visit to the nearby town of Levignac, through which the convoy passes. Although the particular convoy I saw didn’t have a wing shipment included, it did have some A380 fuselage sections. As you can see on the video below (click the link), the clearance between the fuselage and buildings in the town is rather small! I was informed the wing sections are slightly wider than this, resulting in even less room for manoeuvre! Finally, a few interesting facts about the A380 wing..
Each set of wings has 20 panels and 314 stringers. They contain 750000 rivets or bolts! And lots of wire – 23 miles of it! Flying the Airbus A380 – Takeoff! Thank you to everyone who has been so kind about my posts on Twitter. I’m glad (most of) you find it interesting. However, the limited number of characters available per post makes explaining the more complex aspects of flying the A380 a little tricky! So I thought I would start a blog where I can give more detailed descriptions about all things A380…. So let’s get the A380 into the air shall we? Before we go blasting off down the runway we have to perform a takeoff performance calculation using our inbuilt application. 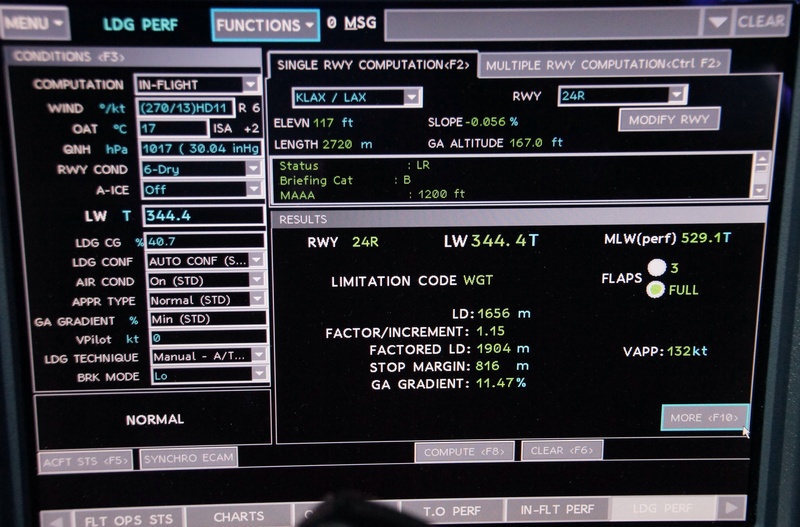 This screenshot shows the takeoff calculation performed for a takeoff from Johannesburg. So what do all the bits and pieces mean? The first thing we do is select the airport, shown top centre of the screen in yellow. In this case FAOR / JNB. To the right of this selection we then choose the takeoff runway and which intersection we are expecting to use. Here, that is runway 03L and we are going to use the full length. 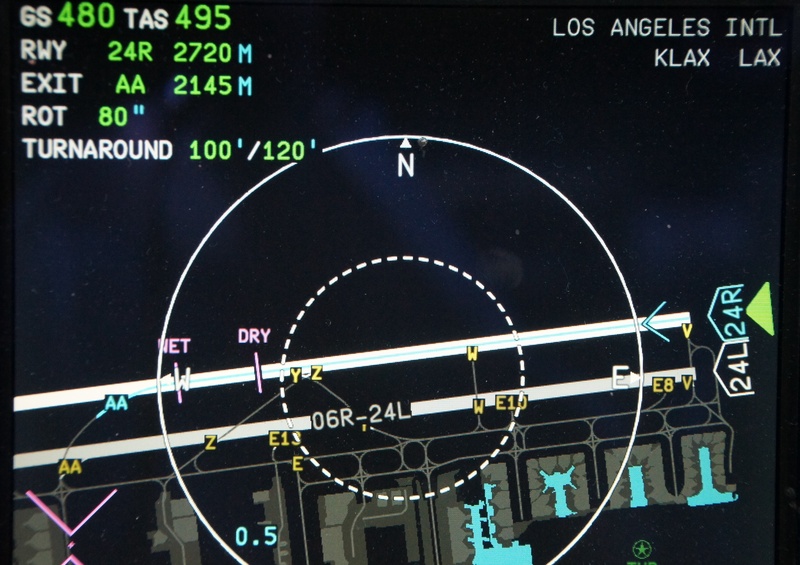 The application displays the runway information immediately below. Quite a bit of detail here, but the main ones we are looking at are TORA – Take Off Run Available, here 4418m and whether there are any obstacles we need to be aware of, or let the application know about, in the area immediately after takeoff. 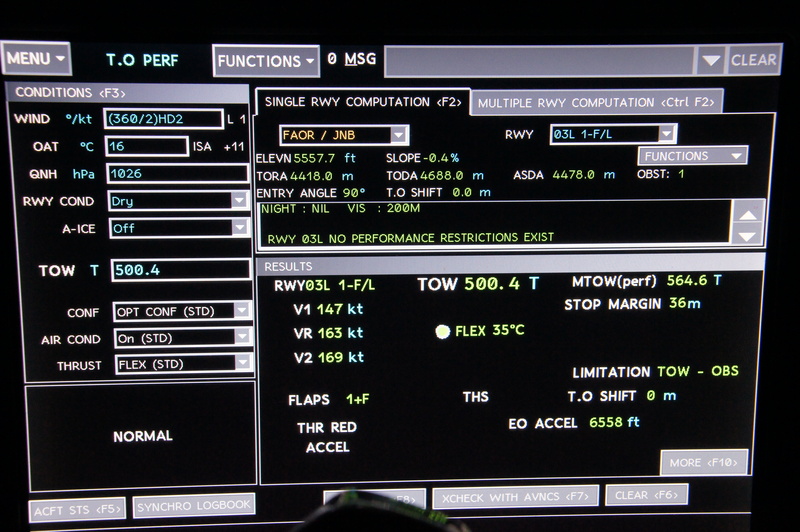 There is also a small window below this information giving takeoff performance restrictions. This would detail items such as emergency turns we would have to perform should an engine fail during or shortly after takeoff. In this case, No Performance Restrictions Exist. There is also a further extension to this definition which covers the situation where there is no actual precipitation at the time, but the taxiways and/or runways have standing water, snow, ice or slush which could be ingested by the engines. The reason a temperature of 10C can still cause engine icing is the cooling effect on the air as it is taken into the engine inlet. For the Rolls Royce Trent 970 engines fitted to BA’s A380s the engine anti ice system takes hot bleed air from the third stage of the High Pressure Compressor (simply put, centre of the engine) and uses it to heat the front part of the engine cowling (basically the silver bit you see at the front of the engine). More details on engines and compressors at a later date! Back to the takeoff performance application. We next enter our expected takeoff weight. Here, 500.4 tonnes. Quite heavy! The next three items are the configuration, ie flap setting. We usually leave this in Opt Conf – optimum configuration, unless there is a good reason not to. Air Cond specifies whether we will be using some bleed air from the engines to power the air conditioning and pressurisation systems during the takeoff. This is similar to the anti-ice detailed above. Using some of the bleed air from the engines to power the air conditioning does slightly reduce the power available for takeoff. In some cases we can use either the APU (small jet engine in the tail) to power the air conditioning, or even perform the takeoff with the air conditioning systems turned off, to achieve maximum thrust. We currently use the APU to power the air conditioning during takeoffs from Hong Kong and Singapore as these present the highest takeoff weights for us on the British Airways network. For all other takeoffs we use engine bleed air. In simple terms, the maximum available takeoff thrust varies with outside air temperature (OAT). As the OAT increases, the air density decreases, so reducing the amount of power the engine produces. So let’s look at our particular case. We can see from the data we entered into the application above that the actual OAT for our takeoff is 16C. However, look at the number next to the green FLEX almost in the middle of the screen, in the Results window. It is showing 35C. So the application has determined that we can use an ‘assumed’ temperature of 35C for the engines for this takeoff rather than the actual temperature of 16C. By telling the engines to use this flexible temperature of 35C instead of 16C, they will not go to maximum power, and so reduce the wear and tear. The A380 can operate over such a range of weights that the reduction in engine power required for takeoff can be quite large. The limit states that the takeoff thrust cannot be reduced by more than 40% of full rated thrust. This is a much greater reduction than allowed on most aircraft. But going back to Jenson and his car, although he will probably spend quite a proportion of his time when racing with his foot hard down on the accelerator, you would expect him to be far more lenient with his own car when driving on normal roads! This is exactly the situation when we are flying. We can use full power when needed, but it is far better for the engines if we back off a little from this when we can. Don’t worry! We are almost there! In addition to calculating how much power we need to use for takeoff, the results window shows us our takeoff speeds and flap setting. V1 is the speed beyond which we are going to takeoff even in the event of an engine failure. VR is the speed at which we will rotate, ie pull back on the sidestick to lift the nose up. V2 is the takeoff safety speed. This is the minimum speed we must fly after takeoff. There are three possible flap positions for takeoff on the A380. Here, we are going to use the first one, Flap 1+F, which is the least amount of flap we would ever use. Other flap settings available to us are Flap 2 and Flap 3. These would normally result in lower takeoff speeds, but would have consequences for the rate of climb achieved immediately after takeoff. There is a balancing act to perform here, and the takoff performance application is usually left to decide the best setting. I will cover the specifics of flap settings and what they mean in a later blog…. Now we have all the information we need. We know how much power to use, which flap setting to use, and how fast we need to be going before we can fly. So let’s get on with it! This is shown by the top dials on the screenshot above. In this case the engines are actually running at around 73% thrust as the photo was taken in the cruise. It is a little busy at takeoff to be taking photos of the instruments! Once the engines have all stabilised at 30% we advance the thrust levers further into the FLX position. This tells the engines to produce the amount of power we previously calculated. The engines accelerate rapidly from 30% to the required, calculated thrust and off we go! 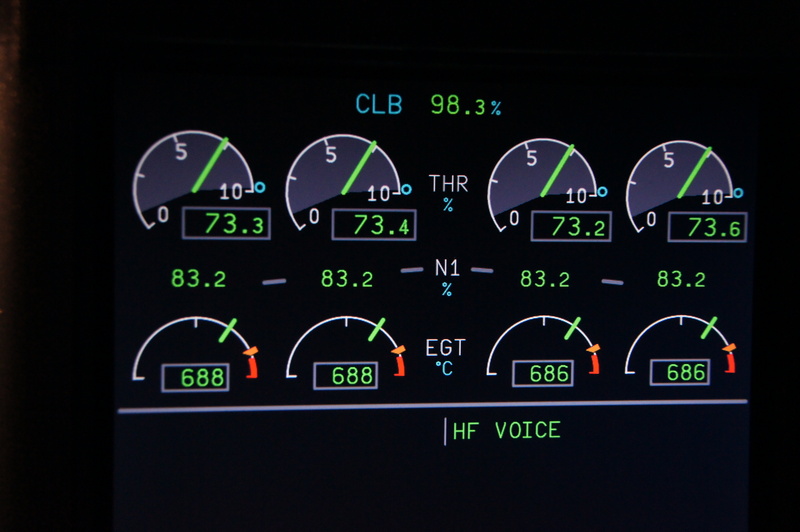 If you have flown with us on our A380s you will, no doubt, be aware of this two stage engine acceleration. There are also a couple of other functions which prevent the engine from operating at certain rotation speeds during the takeoff roll which can result in there being more than one acceleration from 30% to takeoff power. The one which we see most is called METOTS (Modified Engine Take-Off Thrust Setting). It prevents the engine from exceeding 78% N1 below 35kts. This is an engine protection system to prevent fan instability. N1 is the actual rotation speed of the big fan you see at the front of the engine, expressed as a percentage. It is shown just below the ACUTE THR dials. We will often see the engine increase to a power just below the METOTS setting, then as the airspeed increases, a final extra push in the back comes as takeoff power is reached. The other information on the screenshot above is the EGT (Exhaust Gas Temperature). This is the temperature of the air passing over temperature probes at the rear of the engine. So now we are accelerating down the runway. The handling pilot (HP) will be spending most of their time looking out of the window, making sure the aircraft is tracking down the runway centreline using the rudder pedals to make very small changes to direction. The other pilot, or non-handling pilot (NHP), will be monitoring all the aircraft parameters very closely, especially the engine and flight instruments and looking for anything out of the ordinary. This screenshot shows the other engine information. N2 and N3 are internal spinning components of the engine, FF is the fuel flow in kg per hour. The oil quantity is measured in quarts. The PSI is the oil pressure, then there are three vibration indicators for the three spinning sections, and finally an engine nacelle temperature dial. In many ways the NHP is the harder working of the two pilots at this stage as they are monitoring all these parameters while also making sure the HP is tracking the centreline properly, in addition looking at the flight instruments to make sure all the airspeed indications are accelerating correctly and all giving the same speed. The HP is just grinning from ear to ear as they control 500 tonnes of A380 as it accelerates rapidly down the runway! At 100 knots airspeed, the NHP announces “one hundred knots”. The HP looks down and checks their airspeed indicator, makes sure it also reads 100 knots, and states “Checked”. We use 100 knots as a speed below which we would be ‘stop minded’ if we have a problem, and above which is it probably better to continue the takeoff and deal with a problem in the air due to the problems associated with stopping from high speed. So, from this point on, unless we have a major problem, we are not going to stop. Once we reach V1 an automated voice will announce “V1”. From this point on, no matter what problems arise, we are going flying as there is insufficient runway left to stop. In our case we still have 16 knots left to accelerate before the NHP announces “Rotate” at Vr. Now the HP gently pulls straight back on the sidestick, watching for the horizon to drop out of view at a constant rate, and briefly glancing at the flight instruments to ensure all is well. We want to rotate the aircraft at around 3 degrees per second, initially aiming at a climb-out attitude of around 12.5 degrees. The initial rotation takes a little time to establish, but once the nose has started to lift the pitch rate remains fairly constant for a given sidestick input. Once all the wheels are packaged away there is a very noticeable drop in noise level. It is amazingly quiet in the cockpit. We continue flying away from the ground until, normally, at around 1000 feet above the airfield the HP will lower the nose, reduce the thrust to climb thrust, and start to accelerate to S speed. This is the speed, shown on the airspeed indicator, at which the flaps can be retracted completely. The HP will ask for this to be done by stating “Flaps Zero” (sometimes followed by “Please” by those who have been brought up correctly!). The NHP repeats “Flaps Zero”, checks the speed is correct, and moves the flap lever. Now we can accelerate to the usual climb speed of 250 knots when below 10000 feet, and once above that, a typical climb speed of around 330 knots. Then it is time for something very important. A nice cup of white tea, no sugar please!!! 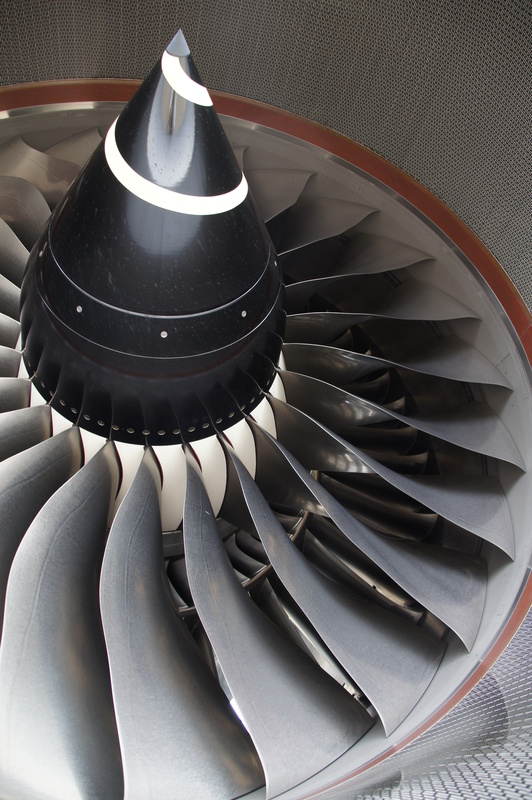 So how much fuel do you think the massive Rolls Royce engines on our A380 use on takeoff? Well, on the last takeoff I flew the flow rate of fuel into each engine on the runway was 8200 kg per hour! So the total flow rate of fuel used on that takeoff was 32800 kg per hour! Considering how much power is being produced, and how heavy the aircraft is at takeoff, it is quite remarkable how quiet it is both inside and outside. I hope you enjoyed the first blog post. Thank you to all those who sent feedback! Operating an aircraft isn’t all about what goes on in the air. Stopping is just as important as going. Now, before we start considering this, a warning…. This is a fairly long piece! So go and make a coffee, get comfy, and we will be fine. Alternatively, read this in bed if you can’t sleep and be prepared for the shock when whichever device you are reading it on hits you in the face when you doze off! Contrary to a fairly common belief, it is the wheel braking system which provides most of the retardation for aircraft. What about reverse thrust? Well, the thrust reversers on the engines are there mostly to help the wheel braking systems but are not the primary source of braking. Indeed, Airbus originally planned for the A380 to not have any engine reverse thrust. In the final version of the aircraft which went into service, reverse thrust is only available on the inboard engines. So our main source of braking is wheel braking. But which wheels are fitted with brakes? Not the nosewheels, they are used exclusively for steering. And what may surprise some people is that not all the main wheels on the A380 are fitted with brakes. The most rearward wheels on the main undercarriage are just rolling wheels. You will see in the photo below that the wheels on the right are much cleaner due to lack of brake dust. Braking is normally carried out using an autobrake function. This also includes a rejected takeoff (RTO) function which applies maximum braking if the thrust levers are closed once above 72 knots during the takeoff roll. Many aircraft have an autobrake system. These are normally armed during the approach and landing briefing, which is typically carried out just prior to starting the descent. 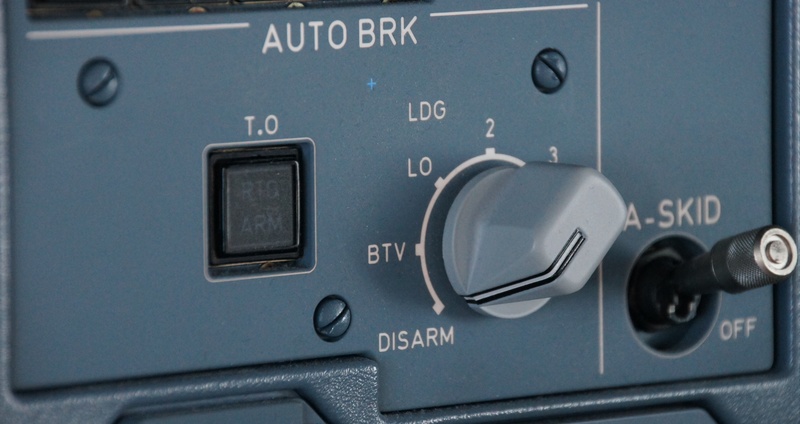 Most autobrake systems are set using either a numbered system, where higher numbers giving a greater braking force, or a descriptive system, such as that used on the A320 series, where either LOW or MEDIUM braking will be selected for landing. Airbus introduced a revolutionary (sorry!) new system on the A380 called Brake To Vacate (BTV). It is optional on the A380, but fitted as standard on the A350. This advanced system allows the landing pilot to pre-select the runway exit they wish to take, and the aircraft will apply automatic braking as appropriate to allow this to happen in the minimum time. The system is quite complex, but works exceptionally well. 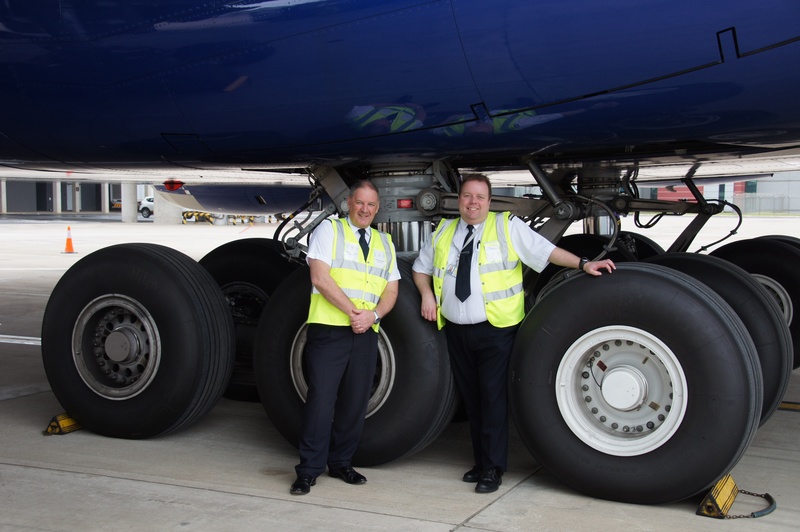 We use this system for virtually every landing in British Airways as it allows us to pre-plan our exit from the runway, reduces brake wear, and is very comfortable for our passengers. So how do we use BTV? Firstly we set up the aircraft systems for our expected landing runway. In this example, we will use runway 24R at LAX. Initially we need to look up the airfield and the specific runway on our LIDO airfield charts. You will remember from the previous blog that we have to make sure we only use those runway exits and taxiways which are colour-coded green, ie. suitable for the A380. Here is the runway exit chart for LAX runway 24R. So what is this showing us? Runway 24R is the runway at the top of the screen. You can actually only see the label for runway 06L here, but that is the same runway from the other end! Do you know how the numbering system works for runways? If you do, skip to the next paragraph. If not, it is actually quite simple. The two numbers are the first two numbers of the compass heading along which you will be pointing when looking down the runway. So in this case, 24 means the runway is set at about 240 degrees on a compass. Runway 18 would be pointing south, runway 09 pointing east etc. Runway 09 would also be runway 27 if you were using it in the opposite direction. If there is a letter after the numbers it means the airport has more than one runway pointing in the same direction so they are differentiated by R for right, L for left, and C for centre. I hope that is clear! Just to the right of the 06L label on the chart you will see a green runway exit labelled AA. 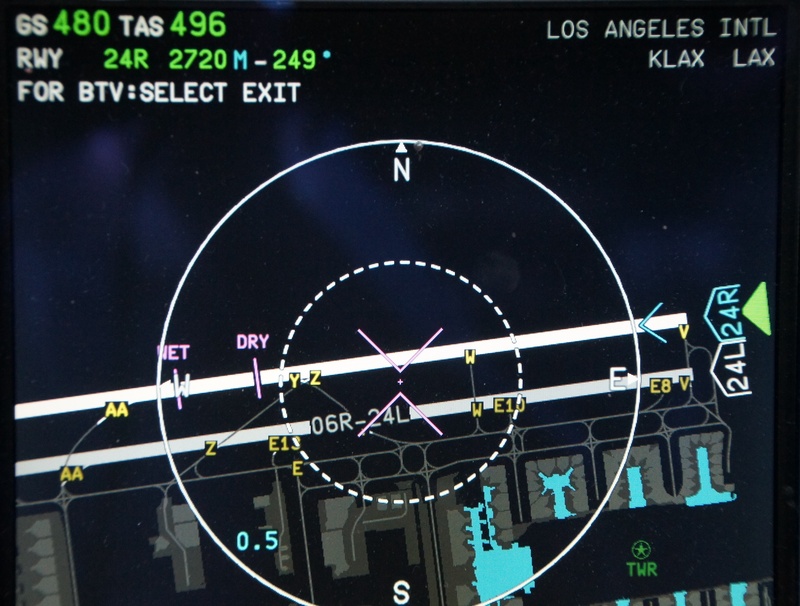 This is the usual exit we use at LAX when landing on 24R (The chart is orientated to the north, so when landing on runway 24R we will be moving from right to left down the runway as shown on this chart). The chart also clearly shows the green colour-coded taxiways the A380 is able to use. Anywhere not coloured green is out-of-bounds for the A380. So, for example, we could not use exit Z, the one to the right of AA. You will see on runway 24R itself there is some writing – 2721 G 46. This indicates the runway is 2721m long, has a grooved surface, and is 46m wide. 46m is a typical runway width. Some are 60m wide. Interesting to think the wingspan of the A380 is almost 80m and the distance between the outboard engines is 51.4m! Lots of numbers here! To summarise, on the left we enter the landing conditions and aircraft configuration. Top, centre, we select an available runway. We then press the ‘compute’ button, and after a few seconds the information in the ‘Results’ window appears. In this case the results show that for landing on runway 24R at 344.4 tonnes we should use FLAPS FULL, our landing distance LD will be 1656m. This is the minimum landing distance required using the autobrake setting we have selected, in this case, Lo braking. We use Lo braking as an indicator to start with as this is the most comfortable braking from a passenger point of view. This distance then has a 15% increment added to allow for handling and other variations on the day (the 1656m figure is that calculated as the best which would be achieved by the Airbus Test Pilots! ), giving a Factored Landing Distance of 1984m. The Stop Margin is how much of the runway will be left when the aircraft comes to a halt. GA Gradient is concerned with aircraft performance in the event of a go-around, so is not something we are considering at the moment. Finally, the figure towards the bottom right, VAPP, is the final approach speed, 132 knots in this case. Despite the A380 being such a massive aircraft, the landing speeds are comparable to A320s and the like. We have determined we need 1984m of runway to stop the aircraft. We know from our LIDO chart that runway 24R is 2721m long, so that is fine. Now we need to determine which exits we are able to make. So lets display our OANS – the Onboard Airport Navigation System. This is effectively a ground-based satnav for the aircraft. It can either display our actual position on an airfield, or we can look up any airfield in the database for planning purposes. In this diagram we have selected runway 24R, as indicated by the numbers being shown in blue. The OANS then displays the information it contains about the runway. Remember the 2721m runway length shown on the LIDO chart? OANS shows 2720m. This is one of our crosschecks. If the LIDO chart and OANS disagree by more than 35m, we are not allowed to use BTV. But here we are fine. You will see two labelled magenta lines drawn on runway 24R. WET and DRY. You will not be surprised to hear that these lines show the position BTV braking has calculated it can stop the aircraft on a wet or dry runway. If possible, even on a dry runway, we would select a runway exit beyond the wet line. Again, this is mainly due to passenger comfort, but also means the braking system isn’t working hard. Right in the centre of the above OANS display you will see a magenta up arrow with a magenta down arrow directly above it, and a small magenta dot in between. This is the trackball cursor. We would now move this over the top of exit AA, shown to the left of the screen, and beyond the wet line, and select this exit. This results in the display changing as shown below. Exit AA is now shown in blue, and the display at the top left shows EXIT AA 2145m, ROT 80″, TURNAROUND 100’/120′. So, exit AA is 2145m along the runway. This is more than the 1984m we calculated we would need earlier using Lo autobrake, so that is fine, and reconfirms the calculated lines BTV drew on the OANS. ROT stands for Runway Occupancy Time. In this case, BTV has calculated this to be 80 seconds for us to vacate the runway at exit AA. TURNAROUND is the time in minutes it will take for the brakes to have cooled below 150C, which we would need before performing another takeoff. There are two numbers. The lower one is the time if we use maximum reverse thrust on landing, the higher number is for reverse idle. The last thing to do is arm the system using the autobrake knob. Now all we have to do is land the aircraft in the right place at the right speed and BTV will control the deceleration for us. It is a superb system. It can be a little unnerving the first few times you use it! This is because it constantly monitors the aircraft speed and position on the runway and, unless you have asked BTV to enable you to vacate at a limiting exit, only applies a noticeable amount of braking fairly late on in the landing roll. This allows the aircraft to naturally decelerate after landing using air braking and reverse thrust, so minimising the work the brake system has to do. Once it has initiated braking, BTV targets a constant (passenger friendly) deceleration rate to achieve a speed of 10 knots, 65 metres from the selected runway exit. However, if the exit chosen is within 300 metres of the runway end, this changes to a target of 10 knots at 300 metres from the end. All sounds nice and rosy so far doesn’t it? So what happens if we land further down the runway than we planned and BTV calculates we cannot stop by the selected exit? Firstly, don’t land too far down the runway in an A380! (or any aircraft for that matter). Better to throw away a poor approach and do it again than try to make the best of a bad job. However, if the landing is only slightly beyond the normal landing point and a limiting exit has been chosen, or conditions on the ground dictate that the original exit now cannot be achieved because the deceleration rate is not what was expected, what happens next? Firstly, remember the best piece of advice ever given in The Hitchhiker’s Guide to the Galaxy. Don’t Panic! On landing, the wet and dry lines displayed on the OANS are replaced by a single green STOP line. This shows where the braking system believes the aircraft will stop. It is constantly updated during the landing roll. If the green stop line goes past the BTV selected runway exit it turns amber, as does the label for the selected exit, a ‘triple click’ sound is heard, and EXIT MISSED is displayed. This is not too much of a problem in this case, as there is still sufficient runway to stop the aircraft, just not to vacate it at the point initially selected. However, what happens if the green line goes past the end of the runway? This would activate the ROW/ROP – Runway Overrun Warning / Runway Overrun Protection systems. These are quite brilliant systems which are worthy of a blog all of their own. And if you have made it this far through this one, you are probably ready for a rest now! So we will cover those at a later date when we have gone through how to operate the A380 when everything is working well, to how we deal with situations where things aren’t going quite so sweetly….! I hope the above has helped you understand how the superb BTV function works and enables us to bring the aircraft down to taxi speed in the most comfortable and efficient way possible. If there is anything which is not clear, or you have any other questions, please let me know via @DaveWallsworth on twitter and I will do my best! If you enjoyed reading this and the previous blog, please pass on a link to anyone you think may be interested, and let me know what other aspects of flying the A380 interest you. Best wishes, and happy flying. Radim on The A380 Fuel System.